However, in reality there are ton of expats looking for the best staycation in Dubai, without looking to break the bank. Many people simply view Dubai as an exotic destination for the rich and famous - but what many don't realize is that Dubai is 92% expats, many of which are eager to find the best place to relax in the sand pit! The vast majority of expats in Dubai fall into 2 very different categories when it comes to relaxing. Half of them are prepped and a drink or two in by the time they walk into an all you can drink and eat alcohol fueled brunch rampage at 11:55am, and the other half are up at 6am on a Friday morning (yes, we work Sunday through Thursday in Dubai) and halfway to some secret hiking spot before you've woken up for breakfast. But not matter what time of expat you are, no one is above a staycation in Dubai, and the options are endless. 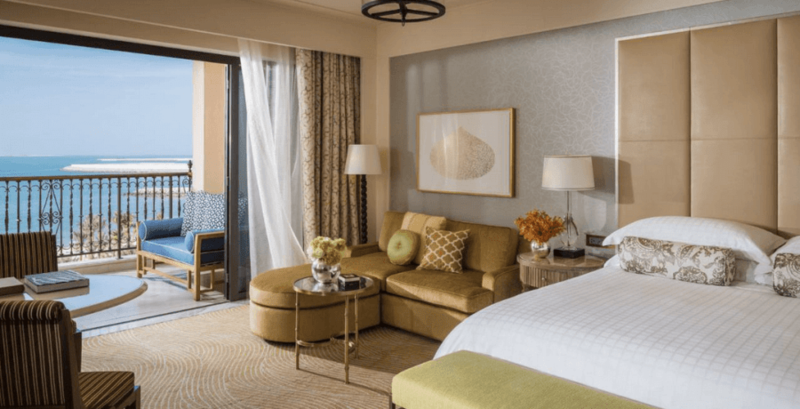 With so many, and we mean SO many, luxury hotels in Dubai, there is rarely a weekend or time of year when you won't be able to find an amazing weekend deal which often includes a brunch, activity pass, etc. With the heat soaring in the summer months, hotels are happy to lower their rates and offer residents some amazing deals. Before ever visiting Dubai I assumed everyone pretty much hid indoors during the summer as simply stepping outside would result in third degree burns, and while this might be true if you go sit at the beach all day in the middle of July, we were happy to find out how pleasant a swimming pool can be - especially at the Four Seasons Dubai - on a hot summer day. We love interacting with our fans and began our popular new video series #ASKWDS in the beautiful pools at the Four Seasons a few weeks ago during a staycation of our own and it was amazing. We spent the entire day poolside enjoying crisp hard cider and the warm sun. Did Jeff get comically sunburned? Of course he did. Would he do it all over again in a heartbeat? Of course he would. If you are new to Dubai and wonder, "Can you drink alcohol in Dubai? ", good question! The official laws stipulate that all alcohol must be served in a bar attached to a hotel, but don't get the idea every place you get a drink in Dubai feels like a lame hotel lobby bar. Dubai is home to some of the most extravagant and unique bars in the world and just because they are in a hotel, or loosely attached, is no reason to write them off. Having unique and beautiful bars inside the hotels only adds to the perfect staycation in Dubai, which for us meant delicious drinks at Hendricks, the amazing gin bar in the Four Seasons Dubai. Pair that with an unending breakfast buffet, flawless sushi by the beach and a bed so comfortable I could die in it and our staycation was complete. Our only advice would be to make sure wherever you stay you do it for two nights, as one is just a tease. So while it doesn't matter if you get 1,000 miles away from home or just around the corner, holiday is a mindset and whether you live in Dubai, London or Bangkok a short and sweet hotel stay might be just what you need to break out of that funk and get back on track, it sure worked for us.